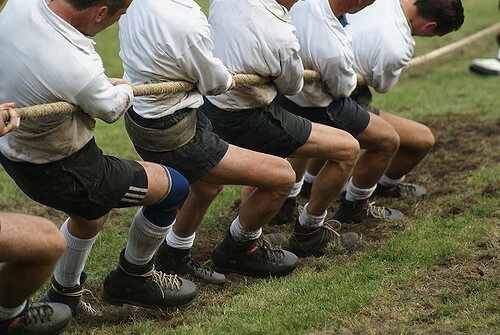 Playing Tug-Of-War With The IT Department - Nextplane, Inc. In many industries, professionals are spoiled for choice. The break-neck speed at which technology evolves from idea to prototype, and then from cutting-edge to obsolete, leaves users in a near constant pattern of adoption and upgrade. These shifting grounds are on clear display in the world of enterprise software, specifically workstream collaboration tools. Professionals in the 21st century economy are required to maintain hyper-specialized skill sets to meet the demands placed upon them. They in turn, require the same level of precision from the tools they use to work as a team and get their jobs done. That demand for specialization has born a highly fragmented landscape of tools being used in any given office or job site. A recent study showed that nearly half of 1,000 business leaders surveyed said their organization was using at least six collaboration tools, and over 1 in 6 were using more than ten. Teams have displayed a clear appetite for WSC (workstream collaboration tools), as there are now well over 100 vendors offering their own unique take on the perfect platform. With all the shiny new software solutions on the market, it’s tempting for employees to jump at new products with an “all that glitters is gold” mentality. But with security, cost control and deadlines at stake, who has the final say when teams want to bring new collaboration tools into the office? In the adoption melee, IT departments are sometimes forced to throw a wet blanket on employees’ drive for better tools. While nobody likes having to play the bad guy, IT has a few very valid reasons to demand control over tools that their employees are downloading and using at work. Cost control — Many popular tools operate on a “freemium” model, but a lot of the premium features come with a cost. IT managers aren’t interested in paying multiple subscription fees for teams when a one-size-fits-all model can save money. Security — IT has a responsibility to implement security assurances in an age where high profile leaks are a regular occurrence. Unity (For Unity’s Sake) — For IT, overseeing six different departments on four different collaboration platforms sounds like more trouble than it’s worth. IT departments see it as their obligation to speak up and push back when employees step too far beyond the pale. Our own upcoming research report (look for it soon) reflects the sentiment on IT departments having complete control, finding that only 10 percent of workers report they have full say in the technology they use. More workers than ever are going remote. Forty-three percent of US workers have at some point done their jobs remotely. With nontraditional environments comes less supervision, and these employees need every tool they can to get in touch with their teams who could be thousands of miles away. Current collaboration methods are inadequate. Companies stand to lose millions per year due to inadequate communication to and between employees. Is there a way for both IT and employees to have their cake and eat it too? Employees know what it takes to get their jobs done, but IT has a responsibility to the organization’s overhead and security. With NextPlane’s new built-in federation functionality, IT can get a grip on the glut of collaboration tools making their way into the market while granting their employees the freedom they need to do their jobs in the 21st century environment. Follow NextPlane on Twitter and LinkedIn for more updates as well as new upcoming research on employees’ habits and attitudes about the role of tech in the workplace.